The High Road travels through awe-inspiring scenery and remote mountain villages that cling to their Spanish colonial roots. Start in Ranchos de Taos, a traditional agricultural community. With its massive adobe buttresses, high ceilings with vigas and hand-carved corbels, the San Francisco de Asis Mission is our most photographed and painted church. Georgia O’Keeffe and Ansel Adams are two of many artists who have depicted the church in their work. The retablos and bultos on the northeast screen were created by Molleno, an early 19th century santero, and the church has the largest altar screen in New Mexico. Be sure to explore the galleries and shops located around the plaza. Visit Talpa’s charming little church of Nuestra Señora de San Juan de los Largos del Rio Chiquito. Then stop at Fort Burgwin, where a garrison was stationed after the Taos Revolt against U.S. occupation. Fort Burgwin is now part of Southern Methodist University, SMU-in-Taos, and hosts summer sessions and is an active archeological site. Drive 30 scenic miles through Carson National Forest to Peñasco, a small farming community. In Las Trampas, admire San Jose de Gracia, a church still in use after 225 years. This larger mission was built in the cruciform style with two towers. 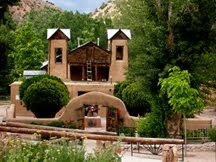 Enjoy visiting artists’ studios in Ojo Sarco, before the little town of Truchas, which was built on a mesa below 13,101-foot Truchas Peak, the second-highest peak in New Mexico. In Truchas, see Nuestra Señora del Rosario, which was built in the early 1800s and has many well-preserved old santos. San Antonio de Padua Church. The church is only open for services, but if you can enter, you’ll appreciate the large altar screen painted by Rafael Aragon and other fine examples of religious work. Travel the “River Road” back to Taos, driving through Española where Spanish explorer Don Juan de Oñate staked his claim 400 years ago. Visit the nearby village of La Mesilla to admire the simple beauty of San Isidro, built in 1918, and the village of Velarde to see Nuestra Señora de Guadalupe, built in 1817. Velarde is also a fruit-growing community, and roadside stands offer the season’s freshest produce. Follow alongside the fertile valley of the Rio Grande as it winds through a narrow canyon to the villages of Embudo, Dixon, Rinconada and Pilar. For information about the artists and studio tours, stop at Dixon’s Casa de Piedra Cooperative and the Pilar Yacht Club. 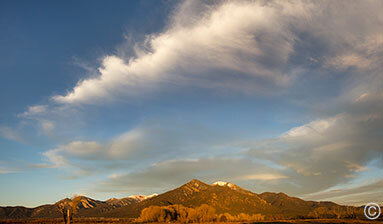 At the top of the "horseshoe turn" just south of Taos, stop to admire the rich landscape of Taos valley. Route: From Taos Plaza, Hwy. 64 north to Hwy. 522 north to Questa; Hwy. 38 east to Red River, then south to Eagle Nest and Angel Fire; Hwy. 64 west to Taos. The most popular tour in our area, this National Forest Scenic Byway circles Wheeler Peak, the highest in New Mexico at 13,161 feet. Throughout the drive, you'll see some of the oldest rocks in the southwest - quartz and feldspar that date back two billion years. Look for special Enchanted Circle markers to help guide your way. Travel through the lush Hondo Valley and watch for the sign to the D.H. Lawrence Memorial but be aware that the facility is often closed due to a restructuring of the management through University of New Mexico. The English author spent much of his time from 1922 to 1925 writing in the solitude of a ranch on this property. After his death, Lawrence's ashes were brought here and placed in a chapel built by his widow, Frieda. Continuing north, the scar on the mountains to your east was left by the San Cristobal/Lama fire of 1996, which destroyed almost 8,000 acres of national forest. Reforestation projects continue today. Stop at the Red River Fish Hatchery which has free self-guiding tours of a show pond and several trout raceways. Children especially enjoy the show pool of the large rainbow trout, but fishermen downstream benefit from the harvest, too! Every year volunteers carry containers of brown trout fry down to the Rio Grande to help propagate the trout population. In Questa, you will want to visit Artesanos de Questa. Local woodworkers, tinsmiths, painters, stained glass workers and sculptors show their work at this cooperative. Continue past Molycorp, Inc., which mines and mills molybdenum, a steel-hardening agent and lubricant. Take a break in Red River and enjoy a stroll through this family-oriented town with an old west feel, complete with saloons and a melodrama theater. Red River offers winter skiing and snowboarding; the ski area lifts also operate in the summer. As you leave Red River begin looking for elk and other wildlife between Bob Cat Pass and Eagle Nest Lake, one of the finest trout and landlocked salmon waters in the United States. The old gold mining town of Elizabethtown is off to the south. Established in 1870 after gold was found, this was the first incorporated town in New Mexico, with at least seven saloons and three dance halls. Visit the Vietnam Veterans Memorial, built by Dr. Victor Westphall and family in memory of the death of his son and others in Vietnam. Take a break in Angel Fire, a four season resort with skiing, golfing, shopping and restaurants. Drive the twisting Taos Canyon road back to Taos. Many of our artists live and work in this canyon. Studios and galleries - painting, pottery, bronze casting, woodworking - are open for visitors to watch artists create their art. Canyon art guide brochures are available at the Taos Visitor Center.